On the occasion of this day, we paid a visit to Kalotaritissa where we had learned of kittens who were in a seriously dangerous condition. There is no one in this area to care for them and, especially in winter, the area is deserted except for a few fishermen who only stop to dock their boats in the marina. We have taken one kitten to our facility and a beautiful young couple from France helped to rescue two of the most seriously ill kittens. Sadly, one did not survive but the couple will travel back to France with their own small kitten and give it a loving home. 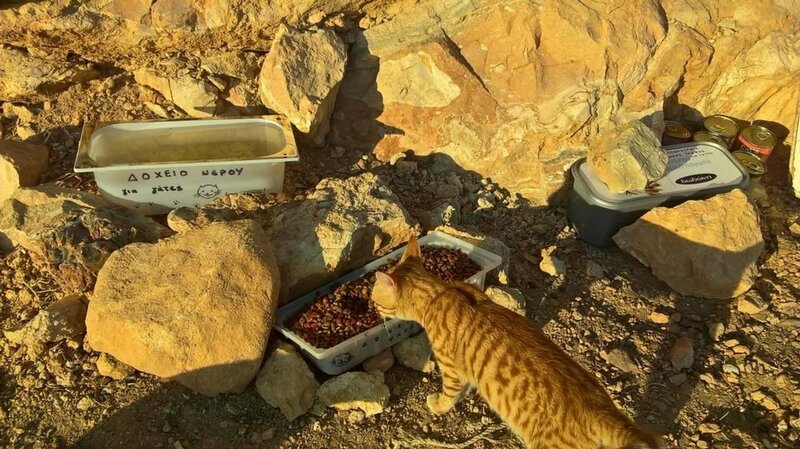 A few of the kittens were so frightened that we could not capture them but we have left feeders and fountains that will provide food and water for one week. Unfortunately, this area is about thirty kilometers from the port of Katapola where our Center is located and so it is difficult for us to visit the area as often as we would like. Therefore, we are in search of volunteers who would be able to visit the area in order to give these small kittens food and water several times a week. In the meantime, we are caring for the one kitten that we were able to rescue and we hope to prepare him for a strong life in a new and loving adoptive family. Photos 1 and 6: The kitten we have brought to our center and we hope to provide a successful treatment for the eyes of this small being that we have named Lucky. Photos 2 and 3: Two of the older kittens who remain in the area and whom we have been able to give medication against worms.